Machu Picchu, a pre-Columbian Inca site, has acquired worldwide fame for its powerful vortex energy and sacredness that are of great appeal to the dedicated pilgrim. As the Mayan calendar is approaching its end, Machu Picchu is becoming the hub of interest because of its profound Mayan history. For the spiritually disposed, it seems to symbolize the end of yet another era in the evolution of mankind. The hypnotizing grandeur of this telluric site is indescribable and its energy is unclouded despite the numerous pilgrims and visitors who negotiate its grounds throughout the year. Seven of the most interesting facts about Machu Picchu are described below. The term ‘Machu Picchu’ literally means ‘old mountain’, and the place is also spoken of as ‘The Lost City of the Incas’, after the title of the book written by Hiram Bingham, an American historian, who rediscovered the site in 1911. This book drew international attention to the place, which has become a famous pilgrimage site and vacation spot in Peru. The site was established in the mid-fifteenth century, but was abandoned by its residents, the Incas, after a century, and remained unknown until its rediscovery in 1911. 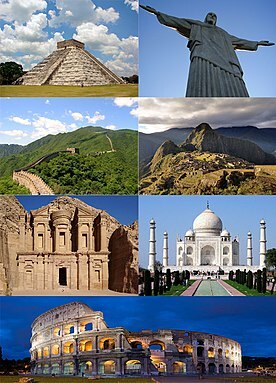 Unfortunately, most cities built by the Inca civilization were destroyed by the Spanish conquest. Machu Picchu was in a hidden location – invisible from below – and not found, making it one of the most well-preserved Inca cities and an archeological gem. Trekking on the Inca Trail is the most popular way to approach Machu Picchu through several portions of original Inca stone pathways. It is a four-day journey, but the government restricts the number of trekkers to 500 due to fear of wearing away the trail. Compulsory porters are included in the trekking expedition. The porters sleep on the trail with a piece of mirror or a gleaming piece of metal under them, in order to prevent being whisked by spirits emerging through the earth. Most of them recount experiences of feeling spirits pulling them out of their tents. Voting from Internet audience has caused Machu Picchu to acquire a place in the New Seven Wonders of the World which were announced in 2007. 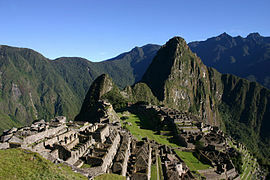 With increasing recognition worldwide, UNESCO has declared Machu Picchu as a World Heritage Site in 1983. The magical city, along with an area of 325 kilometers surrounding it, has gained recognition as a Peruvian Historical Sanctuary in 1981. The compound contains more than 100 separate flights of stairs. Most of the individual staircases were carved from one slab of stone. Although many of the stones that were used to build the city were more than 50 pounds, it is believed that no wheels were used to transport these rocks up the mountain. Rather, it is thought that hundreds of men pushed the heavy rocks up the steep mountain side.